Next time you need to open up your Whirlpool-built direct drive washer (also sold under the Kenmore label), be sure to check the motor shaft and pump drive hub for rust. If you’re replacing the drive coupler— a very common repair on this otherwise fine machine– then you have to remove the motor and pump anyway. Rust on the motor shaft is a tell-tale sign of a leaking pump. Where else would the water come from? The pump fits directly onto this motor shaft. Sometimes, the rusting on the motor shaft can get so bad that you can’t pull the pump off. In these cases, you may need to resort to a destructive removal. 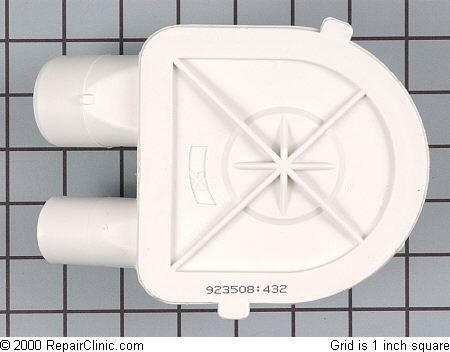 The pump is just plastic and can be removed with hammer, chisel, drilling, whatever works. Doesn’t matter how ugly it gets because the pump is being replaced anyway. 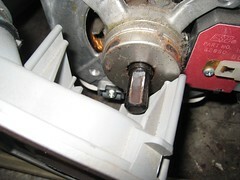 The motor is pretty sturdy– just avoid getting plastic shavings down in the winding– could melt and smell funny. If your washer needs a new pump, come git you one! 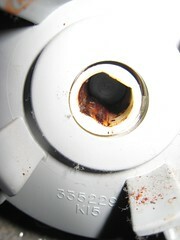 This entry was posted in Washer Repair on May 20, 2009 by Samurai Appliance Repair Man.